Last week I had a new paper come out with some fantastic co-authors (Delavane Diaz, Tom Hertel, and Uris Baldos) on new damage functions in the agricultural sector. Since this covers a number of topics of interest to G-FEED readers (climate damages, agricultural impacts, SCC etc), I thought I’d dig a bit into what I see as some of the main contributions. Firstly what we do. 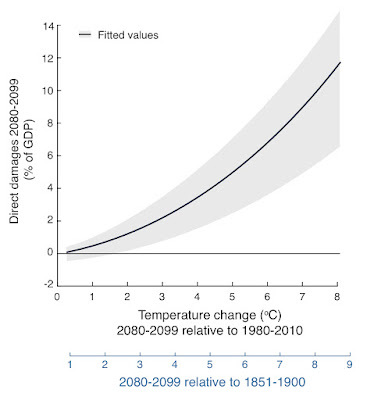 Essentially this is an exercise in trying to link a damage function directly to the scientific consensus on climate impacts as represented by findings in the IPCC. We therefore rely on a database of over 1000 results on the yield response to temperature previously published by Challinor et al. and used to support conclusions in the food security chapter of Working Group 2. 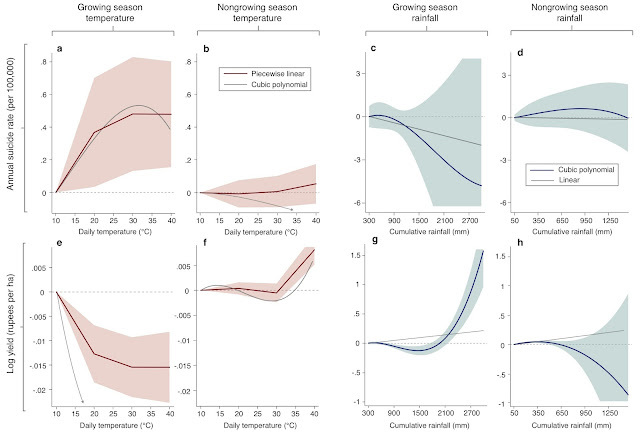 We do a bit of reanalysis (using a multi-variate regression, adding soybeans, allowing for more geographic heterogeneity in response) to get yield-temperature response functions that can be extrapolated to a global grid to give productivity shocks at 1, 2, and 3 degrees of warming (available for other researchers to use here). As readers of G-FEED well know though, getting productivity shocks is only half the battle because what we really want are welfare changes. Therefore, we introduce our productivity shocks into the 140-region GTAP CGE model, which has a particularly rich representation of the agriculture sector and international trade. 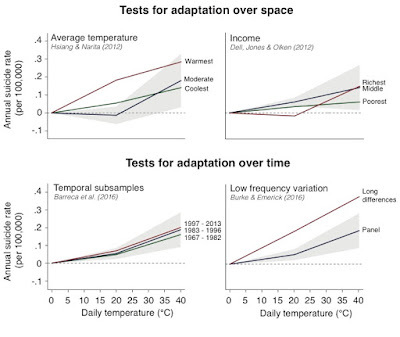 This then gives us welfare changes due to agricultural impacts at different levels of warming, which is what we need for an IAM damage function. Finally, we take our findings all the way through to the SCC by replacing the agricultural damages from FUND with our new estimates. Our headline result is that improving damages just in the agricultural sector leads the overall SCC to more than double. There’s lots more fun stuff in the paper and supplementary information including a comparison with results from AgMIP, some interesting findings around adaptation effectiveness, and a sensitivity analysis of GTAP parameters. But here I want to highlight what I see as three main contributions. Firstly I think a major contribution is to the literature on improving the scientific validity of damages underlying IAM results. The importance of improving the empirical basis of damage functions has been pointed out by numerous people. This is something Delavane and I have worked on previously using empirically-estimated growth-rate damages in DICE, and something that Sol and co-authors have done a lot of work on. I think what’s new here is using the existing biophysical impacts literature and tracing its implications all the way through to the SCC. 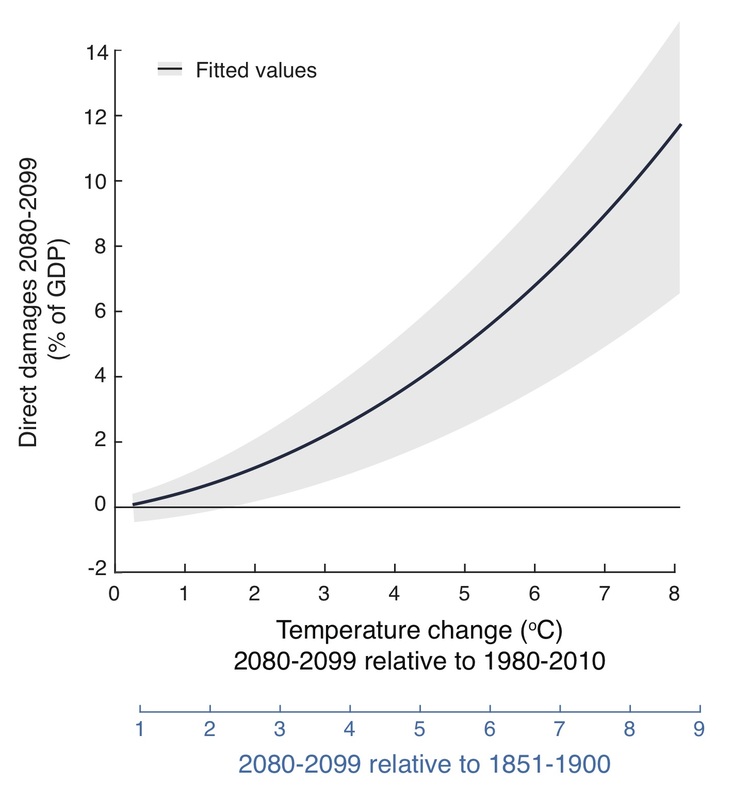 There is an awful lot of scientific work out there on the effects of climate change relevant to the SCC, but wrangling the results from a large number of dispersed studies into a form that can be used to support a global damage function is not straightforward (something Delavane and I discuss in a recent review paper). In this sense the agriculture sector is probably one of the more straightforward to tackle – we definitely relied on previous work from the lead authors of the IPCC chapter and from the AgMIP team. I do think this paper provides one template for implementing the recommendation of the National Academy of Sciences SCC report around damage functions – that they be based on current and peer-reviewed science, that they report and quantify uncertainty wherever possible, and that calibrations are transparent and well-documented. Secondly, an important contribution of this paper is on quantifying the importance of general-equilibrium effects in determining welfare changes. 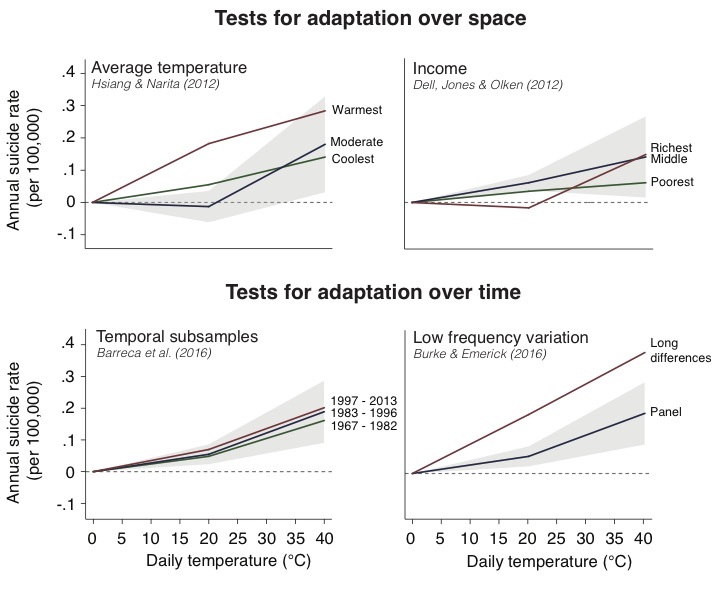 Since so much climate impacts work estimates local productivity changes, it raises the question of what these can or can’t tell us about welfare under global climate change. We address this question directly by decomposing our welfare changes into three components: the direct productivity effect (essentially just the local productivity change multiplied by crop value), the terms-of-trade effect, and the allocative efficiency effect (caused by interactions with existing market distortions). The last one is generally pretty small in our work, so regional changes in welfare boil down to a combination of local productivity changes and the interaction between a region’s trade position and global price changes. This breakdown for 3 degrees of warming is shown below. For these productivity shocks, the terms-of-trade (ToT) effect is regionally pretty important. In a number of cases (notably the US, Australia, Argentina, and South Africa) it reverses the sign of the welfare change of the productivity effect. In other words, a number of regions experience yield losses but welfare gains because the increasing value of exports more than compensates for the productivity losses (with the opposite in South Africa). There are a few rules-of-thumb for thinking about how important the ToT effects are likely to be. Firstly, the ToT effects cancel out at the global level, so if you are only interested in aggregate global damages, you don’t have to worry about this effect. By similar logic, the higher the level of regional aggregation, the less important ToT effects are likely to be, since larger regions will likely contain both importers and exporters. Secondly, the importance of ToT effects depends on the magnitude of relative price changes which in turn depends on the productivity shocks. If the effect of climate change is to redistribute production around the globe rather than to increase or decrease aggregate production, then ToT effects will be smaller. 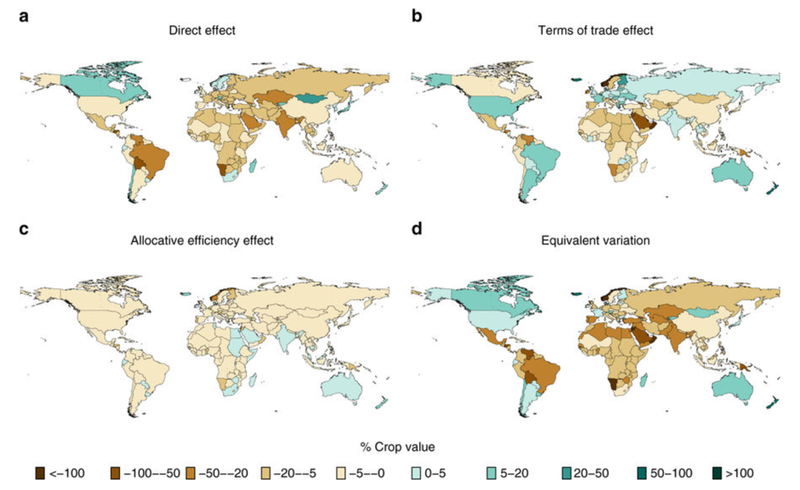 We see this in our AgMIP results, where losses in the tropics are offset to a greater degree by gains in temperate regions, leading to smaller price changes and correspondingly smaller ToT effects. 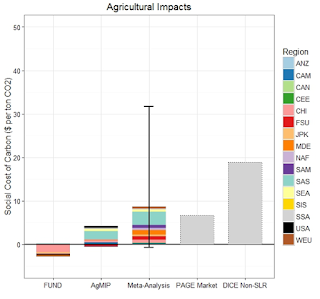 What you see is that our estimated agricultural damages (from the meta-analysis of yield estimates) are actually larger than all market damages included in PAGE. This indicates either that there are very small negative impacts and large off-setting benefits in other market sectors, or that PAGE is substantially under-estimating market damages. Comparing our results to DICE would imply that agricultural impacts constitute 45% of non-SLR damages. This seems high to me, considering this damage function includes both market and non-market (i.e. mortality) damages. 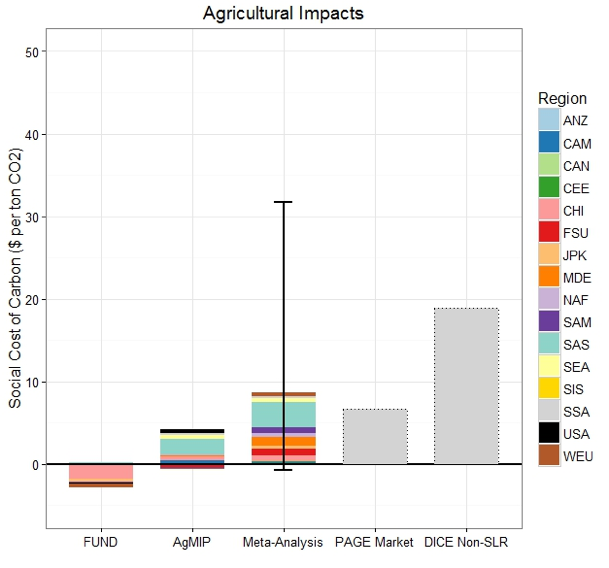 For instance, in their analysis of US damages, Sol and co-authors found agricultural impacts to be dwarfed by costs from increased mortality, and to be smaller than effects on labor productivity and energy demand, suggesting to me that agricultural damages might also be currently under-estimated in DICE. That’s my (excessively-long) take on the paper. Thank you to the GFEEDers for the opportunity. Do get in touch if you have any questions or comments on the paper – fmoore at ucdavis dot edu. We are currently soliciting papers from PhD students and post-docs for a climate economics workshop at UC Berkeley. Proposals are due on November 20, 2017 by 8:00am PST. We encourage papers by PhD students and post-docs undertaking research in any area related to the economics of climate change. We encourage papers that use empirical methods, theory or numerical modelling. Papers can be single authored or co-authored. No restrictions apply to co-authors, i.e. coauthors can be senior researchers. The workshop will explore recent advances in climate economics, with an emphasis on the linkage between empirical and numerical modeling methods. One goal of the workshop is to bring junior and senior researchers together. The final program will combine presentations from invited leading senior researchers and presentations from the most promising junior researchers (PhD students and postdocs). Applications should be submitted online here. Please include either a full working paper or an extended abstract (1-2 pages). PhD students should include a brief letter of recommendation from their advisor that indicates that the submitted abstract/paper will be ready for a full presentation for the workshop. The workshop will be held at UC Berkeley on Fri 1/19 and Sat 1/20, 2018. All travel and lodging costs will be covered for presenters. The workshop is organized by David Anthoff, Max Auffhamer, and Solomon Hsiang, in collaboration with the Social Science Matrix at UC Berkeley. Any questions regarding the workshop should be directed to Eva Seto. A few recent examples of our research getting out of the ivory tower and into the real world. This came up in a recent seminar I teach, so it seemed like others might appreciate the update. "I go without food more days than I eat"
"If I were to take out any more loans, the interest would grow, and my whole family would be forced to kill themselves." 3. Trevor Houser and I recently estimated the potential long-run economic consequences of Hurricane Maria on the economic growth of Puerto Rico and published an op-ed explaining the issue and putting the event in context. Basically, I ran my LICRICE model to compute wind exposure across the island, which totals 123 mph max wind speeds on average across the entire territory. 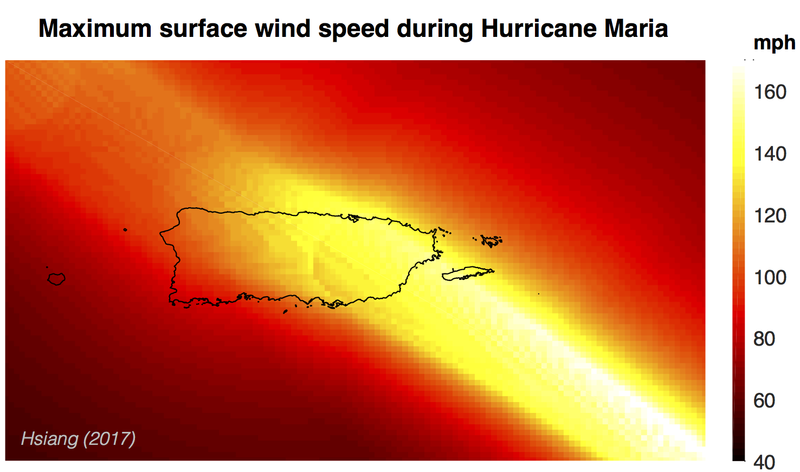 For a territory of this size, especially in the Atlantic, this is unprecedented in my data. "Almost nothing on the planet, short of nuclear weaponry, destroys economic value as rapidly as a mega-hurricane." 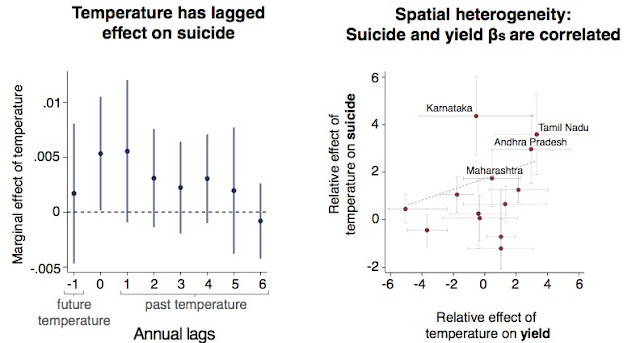 Last week, I published a paper in PNAS addressing a topic that has captured the attention of media and policymakers around the world for many years – the rising suicide rate in India. 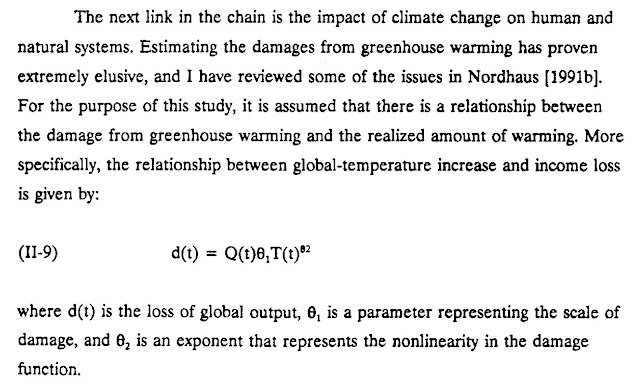 As a dedicated student of G-FEED contributors, I focus on the role of climate in this tragic phenomenon. I find that temperatures during India’s main growing season cause substantial increases in the suicide rate, amounting to around 65 additional deaths if all of India gained a degree day. I show that over 59,000 suicides can be attributed to warming trends across the country since 1980. With a range of different approaches I’ll talk about here, I argue that this effect appears to materialize through an agricultural channel in which crops are damaged, households face economic distress, and some cope by taking their own lives. It’s been a pretty disheartening subject to study for the last couple years, and I’m glad to see the findings out in the world, and now here on G-FEED. 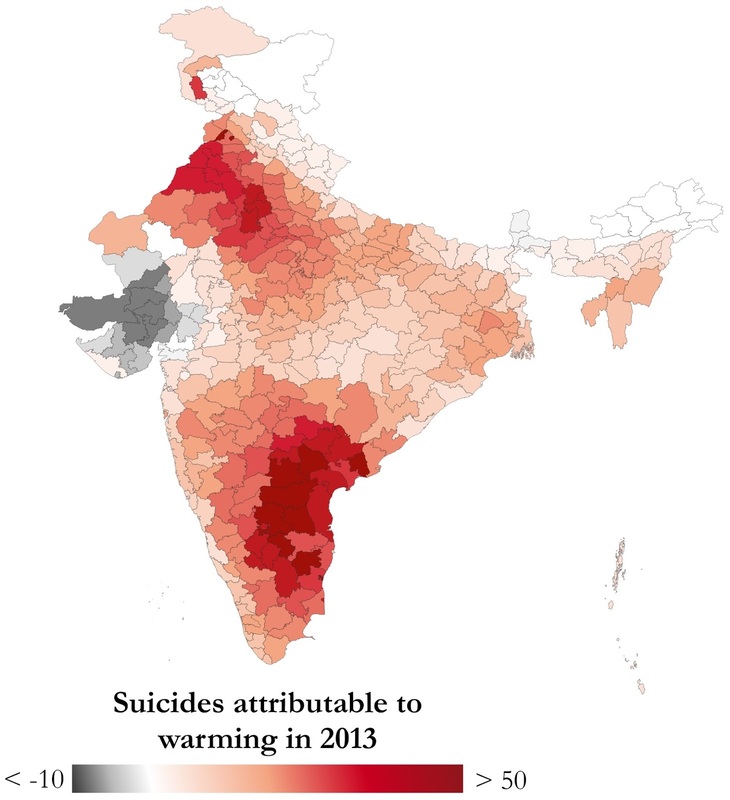 First, a little background on suicides in India. The national suicide rate has approximately doubled since 1980, from around 6 per 100,000 to over 11 per 100,000 (for reference, the rate in the U.S. is about 13 per 100,000). The size of India’s population means this number encompasses many lives – today, about 135,000 are lost to suicide annually. There have been a lot of claims about what contributes to the upward trend, although most focus on increasing risks in agriculture, such as output price volatility, costly hybrid seeds, and crop-damaging climate events like drought and heat (e.g. here, here, and here). While many academic and non-academic sources have discussed the role of the climate, there was no quantitative evidence of a causal effect. I wanted to see if this relationship was in the data, and I wanted to be able to speak to the ongoing public debate by looking at mechanisms, a notoriously thorny aspect of the climate impacts literature. These effects seem pretty large to me. As I said above, a degree day of warming throughout the country during the growing season causes about 65 suicides throughout the year, equivalent to a 3.5% increase in the suicide rate per standard deviation increase in growing season degree days. The fact that the crop response functions are mirrored by the suicide response functions is consistent with an agricultural mechanism. However, this isn’t really enough evidence. Like in other areas of climate impacts research, it’s difficult to find exogenous variation that turns on or shuts off the hypothesized mechanism here – I don’t have an experiment where I randomly let some households’ farm income be unaffected by temperature, as others’ suffer. Therefore, aspects of life that are different in the growing and non-growing seasons could possibly be driving heterogeneous response functions between temperature and suicide. Because this mechanism is so important to policy, I turn to a couple additional tests. While the tools I use are not innovative by any means (thanks to the actual authors of this blog for developing most of them), I think this paper is valuable to our literature for a couple reasons. First, while we talk a lot about integrating our empirical estimates of the mortality effects of climate change into policy-relevant metrics like the SCC, this is a particular type of death I think we should be incredibly concerned about. Suicide indicates extreme distress and hardship, and since we care about welfare, these deaths mean something distinct from the majority of the deaths driving the mortality rate responses that we often study. Second, mechanisms really matter. The media response to my paper has been shockingly strong, and everyone wants to talk about the mechanism and what it means for preventative policy. While I have by no means nailed the channel down perfectly here, a focus on testing the agricultural mechanism has made my findings much more tangible for people battling the suicide epidemic on the ground in India. I look forward to trying to find ways to improve the tools at our disposal for identifying mechanisms in this context and in others. Finally, as climate change progresses, I think we could learn a lot from applying David, Wolfram, and Justin’s method more broadly. While attribution exercises have their own issues (e.g. we can’t, of course, attribute with certainty the entire temperature trend in any location to anthropogenic warming), I think it’s much easier for many people to engage with damages being felt today, as opposed to those likely to play out in the future. 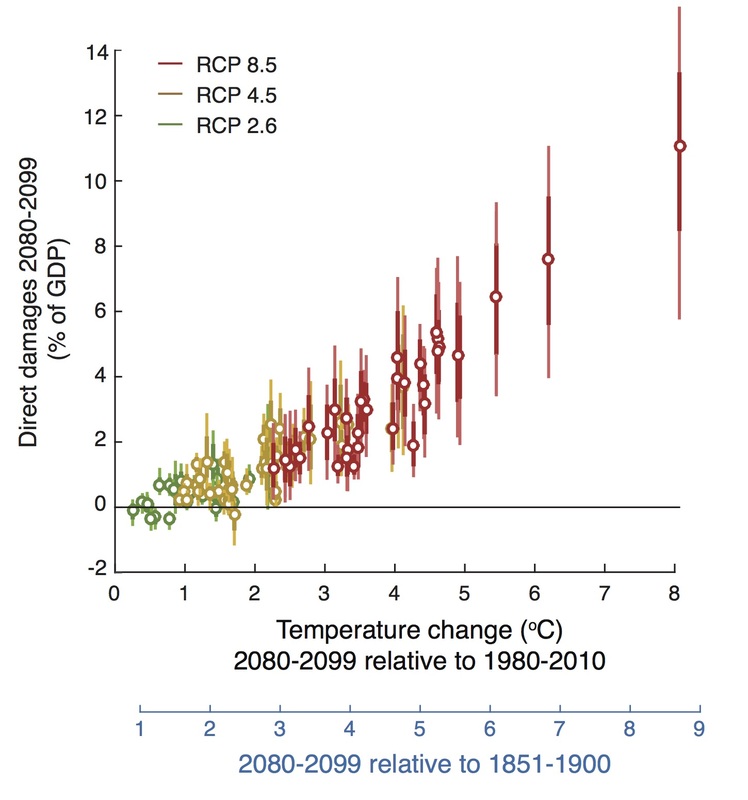 Bob Kopp, Amir Jina, James Rising, and our partners at the Climate Impact Lab, Princeton, and RMS, have a new paper out today. Our goal was to construct a climate damage function for the USA that is "micro-founded," in the sense that it is built up from causal relationships that are empirically measured using real-world data (if you're feeling skeptical, here's are two videos where Michael Greenstone and I explain why this matters). The "extremely elusive" challenge was figuring out what this function should look like, e.g. what should theta_1 and theta_2 be? 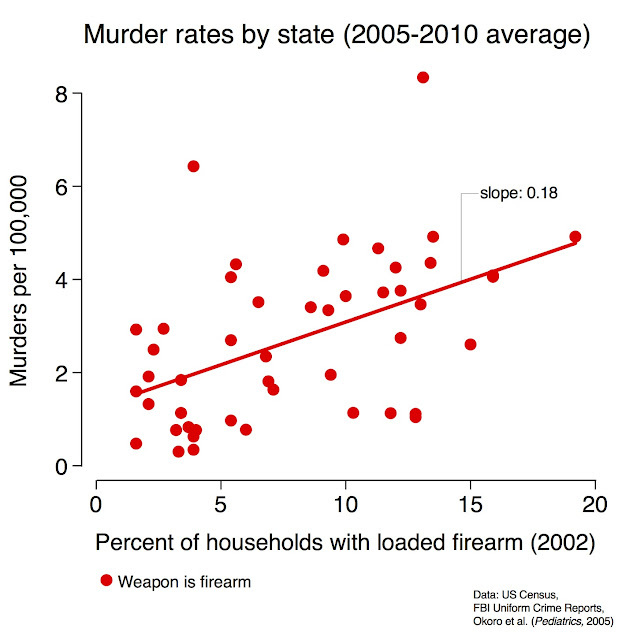 Should there something steeper than quadratic to capture really catastrophic outcomes? Many strong words have been shared between environmental economists at conferences about the shape and slope of this function, but essentially all discussions have been heuristic or theoretical. We took a different approach, instead setting out to try and use the best available real world empirical results to figure out what the damage function looks like for the USA. Here's what we did. We started out by recognizing that a lot of work has already gone into modeling climate projections for the world, by dozens of teams of climate modelers around the world. So we took advantage of all those gazillions of processor-hours that have already been used and simply took all the CMIP5 models off the shelf, and systematically downscaled them to the county level. Then we indexed each model against the global mean surface temperature change that it exhibits. 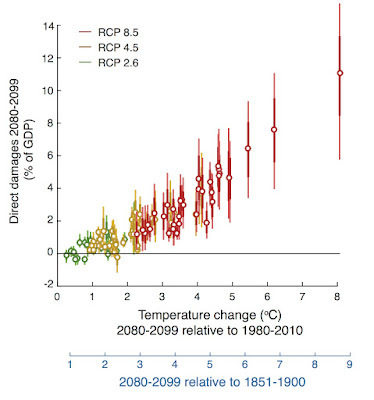 Not all models agree on what warming will happen given a certain level of emissions. 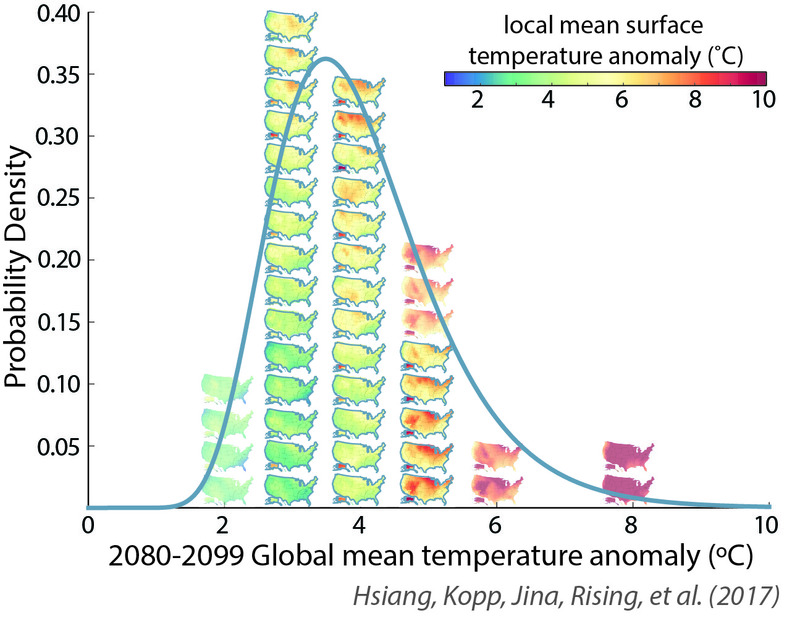 And even among models that exhibit the global mean temperature change, not all models agree on what will happen for specific locations in the US. 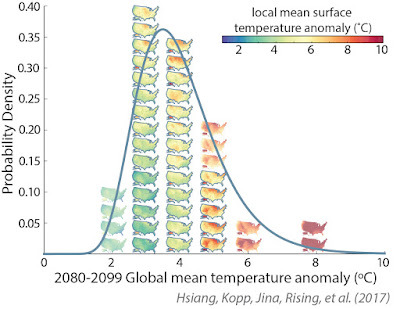 So it's important that we keep track of all possible experiences that the US might have in the future for each possible level of global mean temperature change. Here's the array of actual warming patterns in maps, where each map is located on the horizontal axis based on the projected warming under RCP8.5 ("business as usual"). 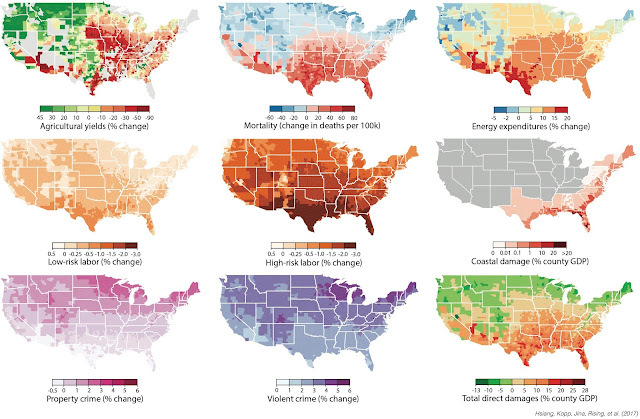 As you can see, the US may experience many different types of outcomes for any specific level of global mean warming. Now, of course, as we say several times in the paper, this function will change as we learn more about the different parts of the economy that the climate influences (for example, since we submitted the paper, we've learned that sleep is affected by climate). So for any new empirical study, as long as it meets our basic criteria, we can plug it in and crank out a new and updated damage function. Note that nothing about this calculation takes into account the possibility that poor counties have fewer resources with which to cope, this is just about interaction of geography and the structure of the dose-response function. This widening of inequality probably should matter for all sorts of reasons, including the possibility that it induces strong migration or social conflict (e.g. think about current rural-to-urban migration, the last election, or the Dust Bowl). But it also should matter for thinking about policy design and calculations of the social cost of carbon (SCC). Pretty much all SCC calculations (e.g. 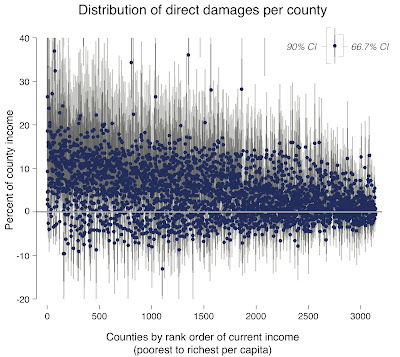 DICE, FUND, PAGE) think about climate damages in welfare terms, but they compute damages for a representative agent that either represents the entire word, or enormous regions (e.g. the USA is one region in FUND). This made sense, since most of the models were primarily designed to think about the inter-temporal mitigation-as-investment problem, so collapsing the problem in the spatial dimension made it tractable in the inter-temporal dimension. But it makes it really hard, or impossible, to resolve any inequality of damages among contemporary individuals within a region (in the case of FUND) or on the planet (in the case of DICE). 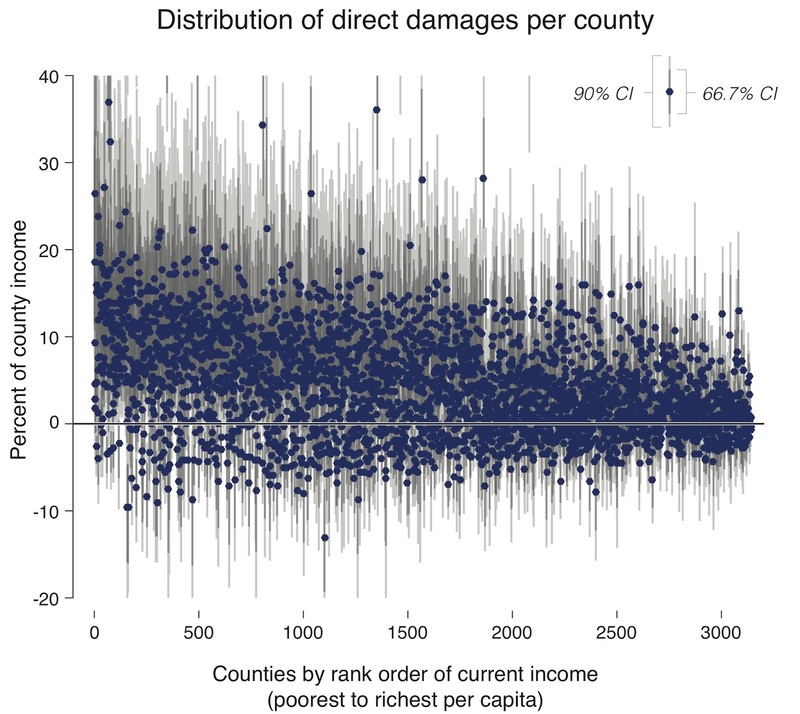 Our analysis shows that there are highly unequal impacts within a single country, and this inequality of damages can be systematically incorporated into the damage function above, which as its shown is simply aggregate losses (treating national welfare as equal to average GDP only). David Anthoff and others have thought about accounting for inequality between the representative agents of different FUND regions, and shown that it matters a lot. But as far as I know, nobody has accounted for it within a country, and this seems to matter a lot too. National inequality-neutral certainty-equivalent loss equal in value to direct damages under different assumptions regarding coefficients of inequality aversion and risk aversion. Shaded regions span results for risk aversion values between 2 and 8 (lower and upper bounds). Dashed line is same as median curve above. 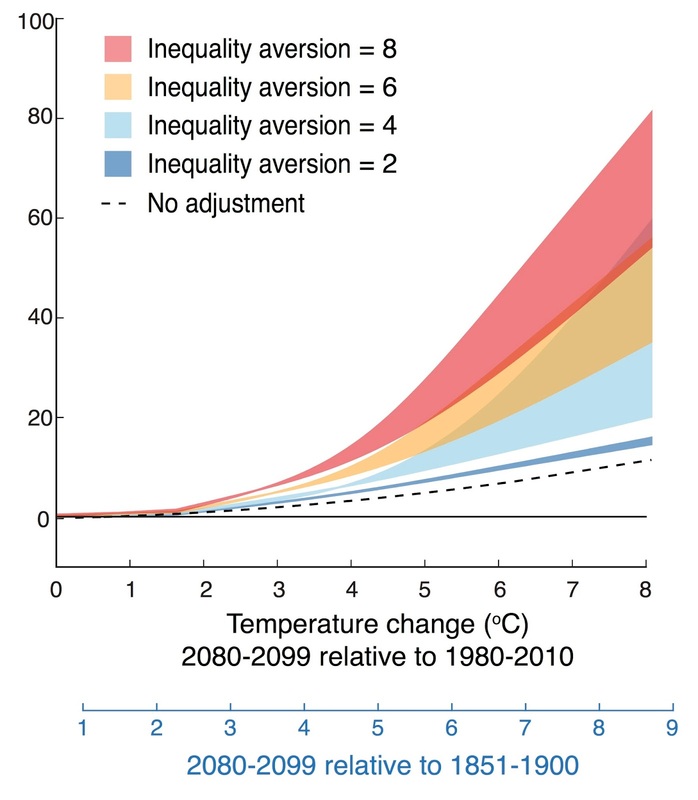 What we see is that adjustment for inequality starts to matter a lot pretty quickly, more so than risk aversion, but the two actually interact to create huge welfare losses as temperatures start to get high. 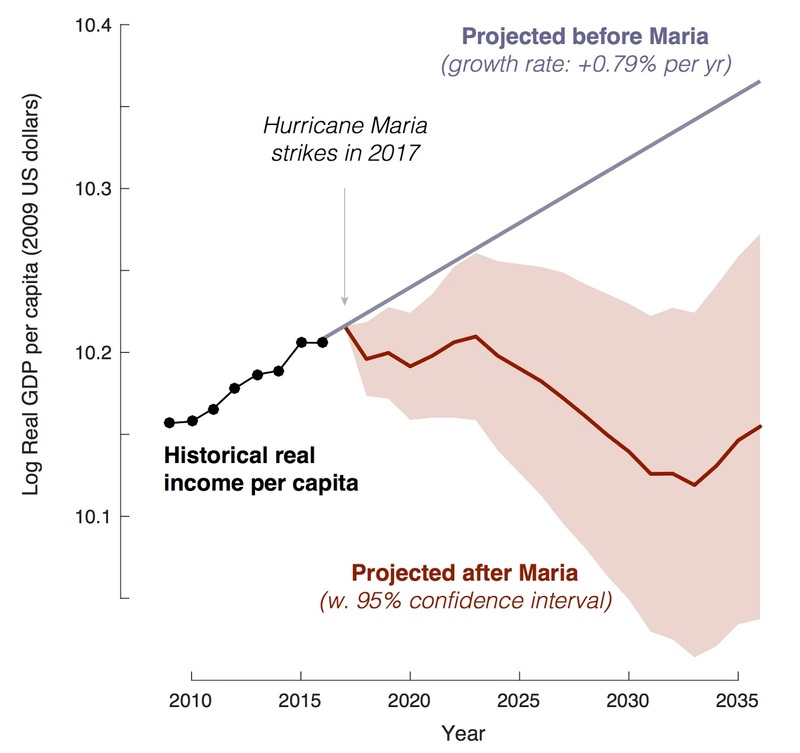 For a sense of scale, note that in the original DICE model, Nordhaus defined "catastrophic outcomes" as possible events that might lower incomes by 20%. Bob, David Anthoff and I have debated a bit what the right values for these parameters are, and I'll be the first to say I don't know what they should be. There are several estimates out there, but I think we really don't talk about inequality aversion much so there's not a ton to draw on. But, just like the discount rate (which has received a lot of attention/thought/debate), these ethical parameters have a huge influence on how we think about these damages. And looking at this figure, my guess is that inequality aversion may be just as influential on the SCC as the discount rate---especially once we start having global estimates with this kind of spatial resolution. 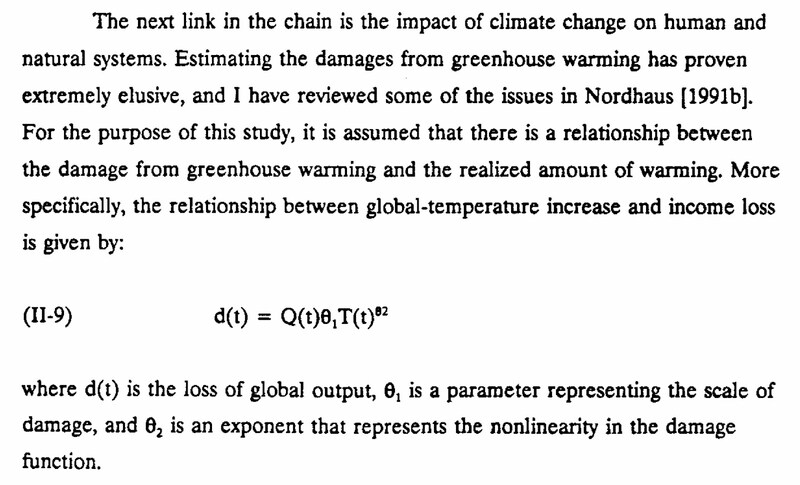 I think this is one of the most important directions for research to go: figuring out how we are supposed to value the inequality caused by climate change and accounting for it appropriately in the SCC.